Each year endometriosis awareness month seems to get bigger and bigger. I would highly recommend checking out the hashtag #endometriosis if you’re on Twitter to keep up with all the news and events from around the world. For this week’s blog post I’m going to be putting some ideas out there about the origin of endometriosis. Not the way in which the disease originates in the body (there could be a whole book written on that subject), but where and when endometriosis actually came from in the history of humanity. Some people tend to think of endometriosis as ‘modern’ condition, however there are several great resources examining the history of endometriosis, for example Dr Nezhat’s paper and Dr Redwine’s book, which suggest that endometriosis has been known about for thousands of years under different names and guises. But this week I’m going even further back, to the beginning. With that in mind let’s start at the beginning, which is always a good place to start. In order to find the origin of endometriosis I started by searching for which animals are known to develop endo spontaneously (there are numerous animals that can be induced to have ‘experimental endometriosis’ but I’m only interested in animals in which endo has been found to occur naturally). Having a thorough search through the literature I discovered endo has been documented in the following animals (see the end of the blogpost for the references). 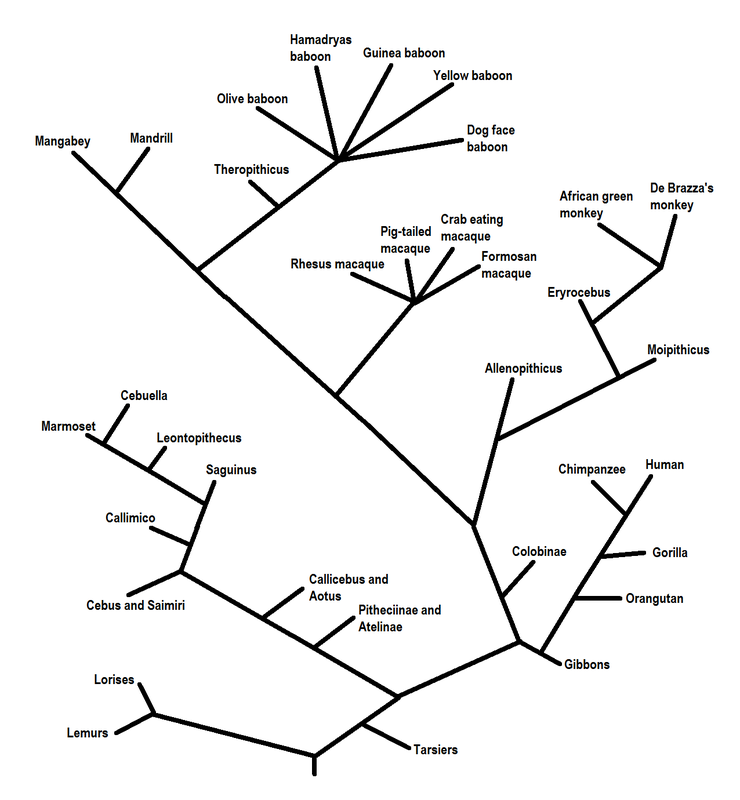 One interesting thing you may notice straight away is that all the species noted above are primates. Endometriosis has never been documented as occurring in any non-primate species (there is a condition affecting livestock called endometriosis, but I won’t be counting that as it refers to degeneration of the endometrium, not the same thing as the real endometriosis). This tells us there is something these animals have in common, not shared by other animals that allows them to develop endometriosis. Given that the majority of these cases of endometriosis in primates have been discovered by accident or when performing autopsies on the animals, it is highly likely that there are other primate species in which endo is yet to be discovered (chimpanzee’s, our closest relatives, are conspicuously absent from the list, for example). What can we do then with the above information? To answer that lets look at how all those species listed above relate to one another. We know from 150 years of evolutionary biology that all living creatures on earth are related to one another in a fantastically complex tree of life of which we are only a tiny branch. Zooming in on the part of that tree that contains the primates we can see our relation to those animals closest to us. Believe it or not, this is a simplified version of the primate family tree, there are numerous species that I’ve left out because they’re extinct and I’ve omitted several species and grouped together others to keep it as simple as I can whilst retaining the important information. Now if we connect all the species in which endo has been found, we can see something very interesting. The red lines connect all the species in which endometriosis has been documented thus far, so now we see the natural history of endometriosis. The arrow near the bottom shows the point at which, from the evidence we have, it is plausible to suggest endometriosis originated. Whatever long extinct animal lived at this point, it passed on the predisposition to endometriosis to its relatives. What that predisposition was exactly remains to be clarified. It must be a genetic predisposition, but knowing exactly what gene or genes are responsible we cannot say. Mostly because there is little agreement as to what genes are associated with endo in humans, let alone across the boundary of species. Whatever it was it changed something, perhaps the way in which the reproductive system developed, perhaps the way in which the reproductive organs function, at the moment we can’t say. If we suppose that endometriosis did originate at this point, we can now theorise as to when endometriosis arose by finding when the species it originated in lived. 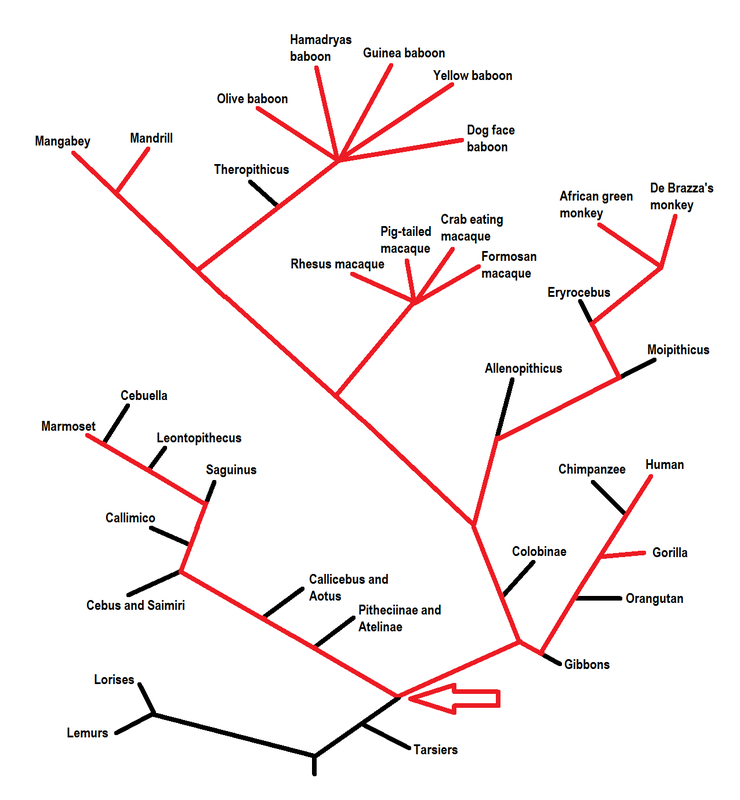 Looking at where all the red lines converge we can see it is at the point in time when the group of primates containing the marmosets (called the New World Primates) split from the group of primates containing humans, chimps, macaques etc (called the Old World Primates). The common relative of these groups is thought to have lived in north Africa near Egypt 1,2, as this is where the highest proportion of such fossils are found. Analysis of the age of these fossils put them at around 33-35 million years old 2. However, using genetic analysis to date species separation based on how closely related they are puts the date at around 43 million years ago 3. From this evidence we can tentatively theorise that endometriosis could be tens of millions of years old; older than human history records, older than humanity itself. We tend to think of endometriosis in terms of human history and why shouldn’t we? Endometriosis affects us in the here and now, but if we consider our past it may give us hints to the answers we’ve been looking for. For example, if we know what animals can develop endo and which ones cannot, then perhaps we should find out why that is. What is it about these animals that make them different? By answering this question we could finally understand what predisposes an individual to endo and maybe even how to stop it. 33. Steiper ME, Young NM. Primate molecular divergence dates. Mol Phylogenet Evol, 41(2), 384-394 (2006). Olive baboon and Yellow baboon: D'Hooghe TM, Bambra CS, De Jonge I, Lauweryns JM, Raeymaekers BM, Koninckx PR. The effect of pregnancy on endometriosis in baboons (Papio anubis, Papio cynocephalus). Archives of gynecology and obstetrics, 261(1), 15-19 (1997). Hamadryas baboon: Shalev M, Ciurea D, Deligdisch L. Endometriosis and stromal tumor in a baboon (Papio hamadryas). Laboratory animal science, 42(2), 204-208 (1992). Guinea baboon: Dallwig RK, Langan JN, Hatch DA, Terio KA, Demitros C. Bilateral hydronephrosis secondary to endometriosis managed by endoscopic ureteral stent placement in a captive Guinea baboon (Papio papio). J Zoo Wildl Med, 42(4), 747-750 (2011). Magabey: Schmidt R, Hartfiel D. Endometriosis in a Gray-Cheeked Mangaby [Cercocebus albigena]. J Zoo An Med, 9(2), 42-45 (1978). Mandrill: Pirarat N, Kesdangsakolwut S, Chotiapisitkul S, Assarasakorn S. Spontaneous diabetes mellitus in captive Mandrillus sphinx monkeys: a case report. J Med Primatol, 37(3), 162-165 (2008). Nakamura S, Ochiai K, Ochi A, Ito M, Kamiya T, Yamamoto H. Spontaneous Endometriosis in a Mandrill (Mandrillus sphinx). J Comp Pathol). Marmoset: Spontaneous pathology of the common marmoset (Callithrix jacchus) and tamarins (Saguinus oedipus, Saguinus mystax). J Med Primatol, 38(5), 347-359 (2009).